Spanish explorers dubbed the area “Cockroach Bay” due to the abundant Horseshoe Crab population. Modern-day visitors will experience a great full day of birding at this site, thanks to impressive habitat restoration efforts; over 260 species of birds have been recorded. Start at the kiosk on Gulf City Rd. south of the preserve office for hiking and paddling maps and a birding guide; a labyrinth of foot paths fans out from here. Your first destination should be “Mount Cockroach” not far west of the parking area—climb the “summit” for an unobstructed view of the landscape and Tampa Bay in the distance. You can also check along Cockroach Bay Rd. on foot, and a series of trails can be found on the south side of Cockroach Bay Rd. as well (some trails may be inundated with water in summer). Over 20 species of duck have been recorded during the winter, Reddish Egrets, Roseate Spoonbills and Gray Kingbird in the spring/summer months and be sure to listen carefully for the elusive Mangrove Cuckoo, which has bred here in summer. Access the Horseshoe Crab and Snook Canoe Trails from the boat ramp at the west end of Cockroach Bay Rd. to enjoy a leisurely paddle. 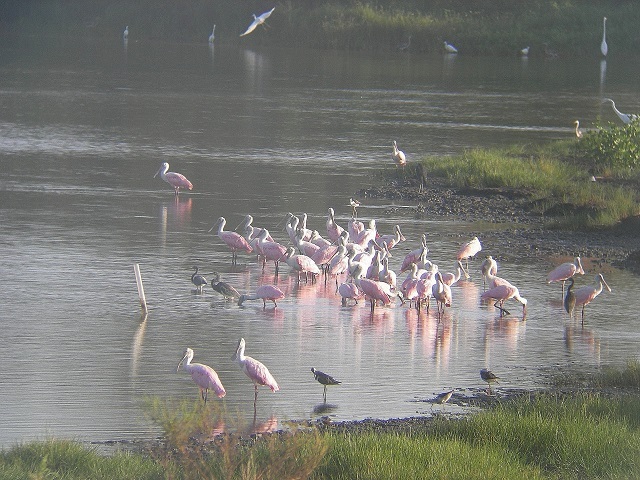 Rarities recorded at this popular site include White-faced Ibis, Baird’s Sandpiper, Black-billed Cuckoo, Tropical Kingbird, and Fork-tailed Flycatcher.